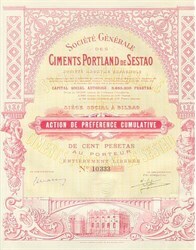 Beautifully engraved Certificate from the Ciments Portland De Sestao issued on October 30, 1929 the day after the Stock Market Crash. This historic document has an ornate border around it with images of sculptures and a building under construction. This item is hand signed and is over 71 years old.